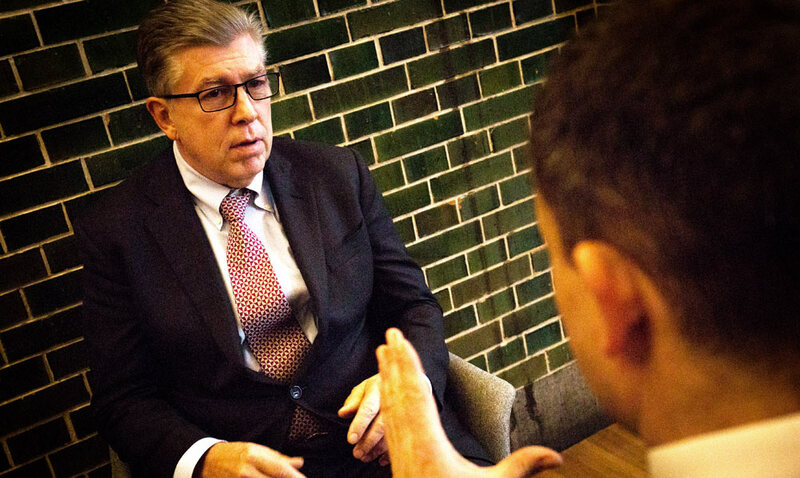 Proving and demonstrating the value of the trading desk at the very highest levels of the organisation creates a virtuous circle of investment and performance, James Wallin tells The DESK. New York-based James Wallin is senior vice president in AllianceBernstein’s Fixed Income group. Prior to joining AllianceBernstein (AB), he worked at Morgan Stanley Investment Management, Evergreen Asset Management as senior counsel and Yamaichi Capital Management, where he served as general counsel and chief administrative officer. Prior to working at Morgan Stanley, he also worked in the legal department of The Dreyfus Corporation and with the law firm of Cole and Dietz. Why has the trading of instruments within a long-only investment process become so important? I think there are a number of major reasons, the first is the focus on sourcing liquidity both as a means of maximising Alpha and as a risk mitigation tool. We think the best way to help accomplish this is to define and centralise the trading function in a way that allows you to leverage the skills of dedicated traders across your account universe. This creates efficiency and enables firms to attract trading professionals who are able to source liquidity and generate discrete alpha at the transactional level. Furthermore, the challenges posed by the evolving fixed income market environment essentially demand that you focus on execution as a discrete part of the investment process. So even if you haven’t made the internal business case to look for greater centralisation and focus in your trading function, both regulatory demands and the changing market landscape requires greater focus on trading as an independent function. While many firms have centralised trading, only a handful have successfully leveraged the function from the alpha generation, liquidity and risk mitigation perspective. How do you see it contributing to the investment process? The obvious answer is that the better the overall execution the better the performance you have. This is even more of a challenge in a liquidity constrained environment where the goal is to optimise both liquidity and execution levels. Fixed income has an asymmetrical risk profile and anything you lose up front – or on the way out – is lost for good. Good trading is a predicate for good performance. But it’s more than that, the trading function has to both identify sources of liquidity and provide important feedback regarding the market, as well as individual names, in a way that informs and supports the investment process. Has the pressure to improve the trading function been driven by investment teams, management or traders themselves? All of the above. The investment teams recognise and welcome the input the traders can provide at both the market and issuer level. Management recognises the need to generate returns for clients and the realisation that top calibre execution capability is an important contributor. I think management is increasingly convinced that dedicated and focused trading is the best way to achieve this. As to the traders themselves, assuming you’ve put in place the proper metrics and incentives, I think it goes without saying that they would focus on execution as a key part of the investment process. And again, for all stakeholders, the ability of the trader to source necessary liquidity is a prime consideration. If you were to chart a curve showing the extent of trading transformation, where do you think we are in the process? On the continuum of trading desk transformation I think that most major fixed-income shops have established trading as a separate function from portfolio management, which could be thought of as representing the middle of the curve. The next phase is to manage both regulatory challenges and the challenge of a market environment that has already seen significant change, but which we can expect to change even more drastically over the next three to five years, with the inevitable surprises along the way. This next phase includes generating alpha and managing liquidity, as well as accommodating new execution formats and strategies. We at AB believe that we are among the handful of firms that have made significant progress in this next phase. How would you characterise the fixed income trader of today against the crisis era trader in 2007? While not all agree, our view is that liquidity is dear in today’s market and it is incumbent on the trader not only to source the liquidity but to ensure that our clients are not paying too much for it. Without impugning the ability of pre-crisis traders the fact is that the large dealers were able to provide huge liquidity to the market and therefore by definition execution was less of a challenge. Post-crisis, trading is increasingly part of the alpha-generating process and is also viewed as an important risk mitigation tool, with the result that the trader is more of a price maker as opposed to a price taker at firms that have taken the lead. How have the changing goals of investment managers affected the responsibilities of the desk? I don’t know if we’re talking about changing goals, I think we’re talking more about a changing market and the realisation that excellence in execution is a predicate to good performance and remaining competitive. Managers understand the importance of trading and are taking steps which recognise that. This not only includes trading in single issues, but developing strategies for basket and portfolio trading, as well as other innovations, in the new environment. What is your opinion of the metrics used to measure traders’ performance? Unlike the equity markets which have granular and broadly accepted measures of trading cost and performance, measuring execution quality in the fixed income market is much more subjective. Of course at the end of the day the trading performance will be reflected in the overall performance metrics of the firm, but that doesn’t mean we don’t need more granular metrics. Not only would they be helpful for business purposes but the new regulatory environment will require clearer metrics. By definition these metrics will have to factor in liquidity in the success traders have in sourcing liquidity without sacrificing return. Do you expect the trading desks and PM functions to consolidate in the future with the advent of technology? No, I think that the functions will remain separate from the standpoint of the individuals involved even though the technology may become more integrated. The ability to have a seamless environment between your execution and settlement, your portfolio, accounting and analytics is key to an efficient and entirely transparent management environment. And that gives you a clear advantage in terms of all aspects of an asset management firm, from reducing your errors at a very mechanical level to having a strong command of what your positions are, of the market, and your views on the market. As noted previously, it is not only important to enhance the technological support for traditional single issue trading, but also to support new strategies and formats as they emerge. What is your expectation for sell-side evolution in credit and rates? As buy-side desks continue to move to alternate execution venues I think we may see some of the dealers become participants in these venues opportunistically for both proprietary trading reasons and as liquidity providers. I think you might see some shrinkage in staff on the sell side, and more concentrated focus on certain trading areas deemed profitable. On that point I think many firms will gravitate towards specialisation. I don’t necessarily think you would see consolidation, more a shift in focus. Which of the market structural reforms are you most and least in favour of? 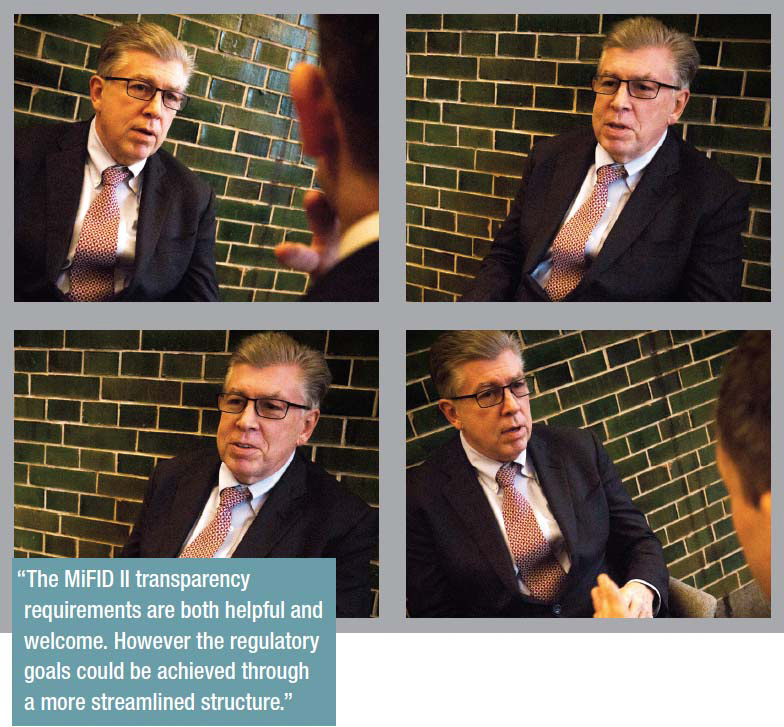 The MiFID II transparency requirements are both helpful and welcome. However the regulatory goals could be achieved through a more streamlined structure such as TRACE that is in place in the US. Taken in this context I think MiFID II is overly prescriptive and places too much of a burden on the buy side. I also think the rules relating to fixed-income research are misguided and incorrectly transpose the equity construct on the fixed income market. The belief that spreads will narrow with the unbundling of fixed income research is misguided and I think that fact is being recognised by the regulators, albeit belatedly. How will European regulation impact US trading in 2018? I think the biggest challenge for trading and compliance groups is to figure out where the impact of the MiFID rules begins and ends. This is a significant challenge for global managers. The research rules in particular impact global managers since most jurisdictions have not gone to unbundling nor do I expect that they will. What change would you expect to see that might positively impact liquidity in corporate bonds? The increase in data availability, in particular through data aggregation tools, and emergence of alternate venues such as “all-to-all” should have a positive impact. As long as we have protection for block size trades, I don’t see a negative impact on liquidity, but that’s something that is still under discussion with regulators. It’s something that we feel strongly about, so there is the potential for impact on liquidity if protection for blocks is not effective. If we continue to develop along the lines of using electronic trading for smaller to medium sized trades, and continue to use voice for the larger trades, there could be some bifurcation between high and low-touch orders, there could even be specialisation within the buy-side desk. However whether this will lead to polarisation of trade sizes is not clear; you can only trade what you have, and structurally there is an inverse relationship between the number of trades that you do electronically and the principal amount you trade. Have senior management kept pace with trading desk evolution? I know it is the case at AB and I believe that management throughout the industry understands the importance of trading. I don’t think we would’ve seen the increased focus on trading as an independent function over the last decade if this were not the case. How does the desk impact client decisions, and is that recognised? As we previously discussed, the desk is involved in decisions as to how to better source alpha for clients and provides significant feedback to the portfolio construction process. The role of trading is highlighted in our client presentations and other client facing communication, with a focus on the risk mitigation benefits that flow from having a well-organised trading function. What are the biggest decisions management need to make regarding their trading desks next year? I think that getting a handle on internal and external data, implementing data aggregation strategies and the shift to alternate execution venues, such as all-to-all, will be significant challenges for 2018 and beyond. Also the need to accommodate alternatives in emerging trading strategies and mechanisms will need to be supported by new technology. Is the seniority of PMs over traders changing? To the extent there ever was a hierarchy, I don’t see it now as they are complimentary roles. Trading has been established as an independent function and is a real time contributor to the investment process.